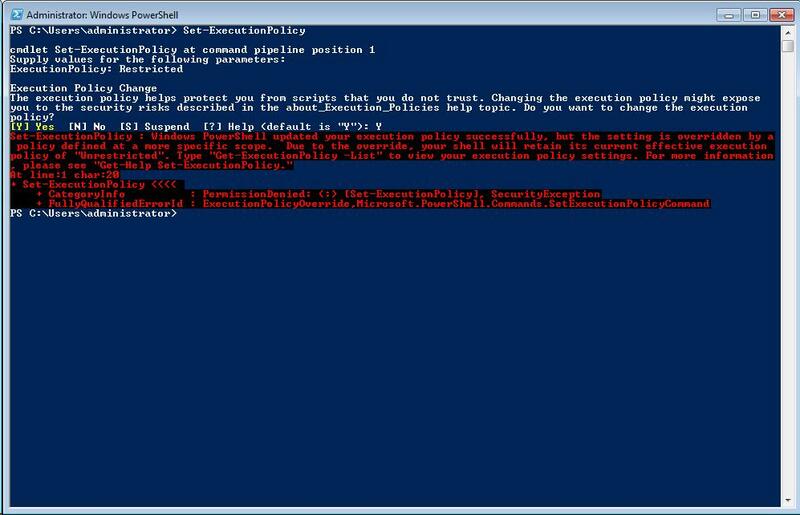 Windows PowerShell ExecutionPolicy let you determine the conditions under which Windows PowerShell loads configuration files and runs scripts. You can set an execution policy for the local computer, for the current user, or for a particular session. 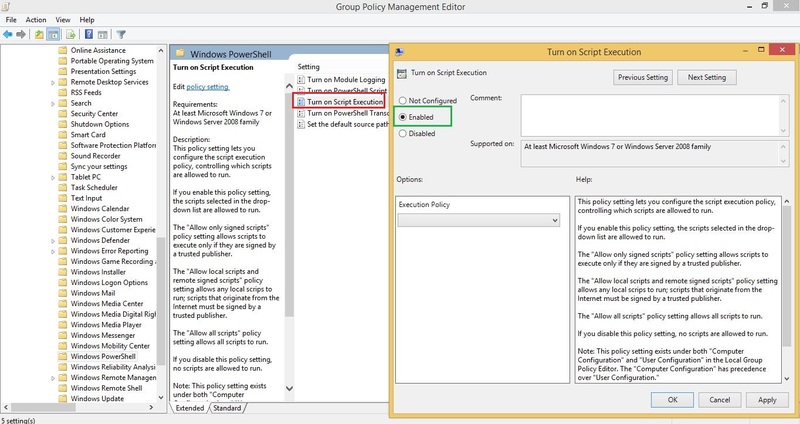 You can also use a Group Policy setting to set execution policy for computers and users. Execution policies for the local computer and current user are stored in the registry. You do not need to set execution policies in your Windows PowerShell profile. The execution policy for a particular session is stored only in memory and is lost when the session is closed. The execution policy is not a security system that restricts user actions. For example, users can easily circumvent a policy by typing the script contents at the command line when they cannot run a script. Instead, the execution policy helps users to set basic rules and prevents them from violating them unintentionally. This is default execution policy in Windows 8, Windows Server 2012 and Windows 8.1. Restricted: Does not load configuration files or run scripts. “Restricted” is the default execution policy. Prevents running of all script files, including formatting and configuration files (.ps1xml), module script files (.psm1), and Windows PowerShell profiles (.ps1). Process: The execution policy affects only the current Windows PowerShell process or session. -Force is also an optional parameter which suppresses all prompts or Warnings. By default, Set-ExecutionPolicy displays a warning whenever you change the execution policy. However there are other optional parameters which can be used with Set-ExecutionPolicy cmdlet, but they are not usually used. You can see complete list of parameters and description using Get-Help command. The change done using Set-ExecutionPolicy cmdlet is effective immediately; you do not need to restart Windows PowerShell. If you set the execution policy for the local computer (the default) or the current user, the change is saved in the registry and remains effective until you change it again. If you set the execution policy for the current process, it is not saved in the registry. It is retained until the current process and any child processes are closed. If you often need to change the execution policy on computers in your Active Directory domain to allow unsigned scripts, you may want to apply this setting centrally via a Group Policy Object (GPO). The Set-ExecutionPolicy command will allow you to pass the policy values for PowerShell’s operation level. For scripts you write yourself, in most situations, administrators choose the Unrestricted policy. The Disabled option will prevent PowerShell scripts from being run and enforced via a GPO. If the GPO value is set, the computer accounts do not have the ability to change their local execution policy. The below Figure shows this behavior, even run as a Domain Administrator. There are a number of considerations for this type of configuration around script security. The best practice will depend on the security policy of the systems involved. Applying the setting that enables PowerShell scripts to a GPO that corresponds to relevant systems is a practice that would fit most situations.